Buck Bonham (Willie Nelson) is a country music singer who enjoys life on the road traveling to different concert venues with his band much to the consternation of his wife Viv (Dyan Cannon) who wants him to stay home more and help raise their child. 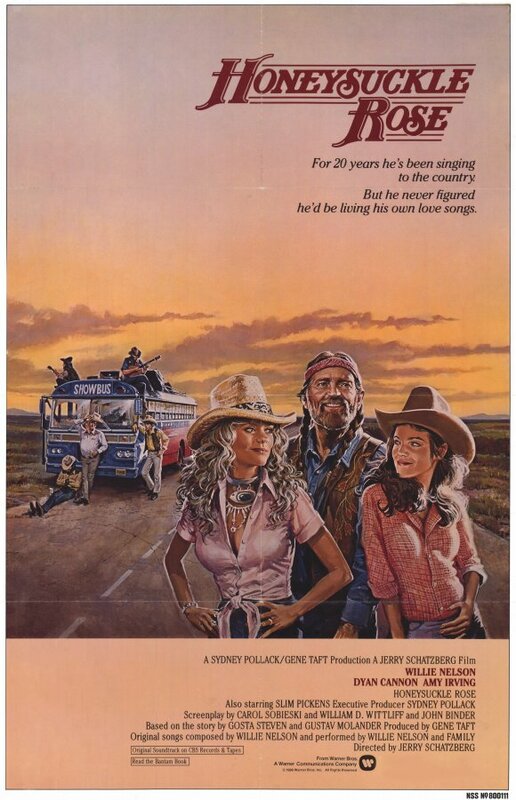 When his longtime guitarist Garland (Slim Pickens) decides to retire they bring in Garland’s daughter Lily (Amy Irving) as a temporary replacement. Then Buck starts fooling around with Lily, which creates turmoil both with Buck’s relationship with his wife as well as Lily’s relationship with her father. After his successful stint in Electric Horseman this film was supposed to send Nelson to the next level as a leading man, but fails miserably because the guy just can’t act. In fact he conveys his lines in such a laid back manner it’s almost like he’s half-asleep and not even there. His screen presence is nil and he ends up being badly upstaged by both Cannon and Pickens. I realize he is considered a country music legend and has many adoring fans, but personally his trembling voice type of singing is not for me. Out of the many, MANY songs that he sings during the course of this picture the only one I even remotely liked was ‘A Song for You’ and even then I consider the Leon Russell version to be far superior. The film like its star is too laid back. It takes a full 30 minutes before we get anything even resembling a plot going. There’s lots of concert footage and scenes taken on their traveling bus, which to some extent gives the viewer a good taste of what life on the road is like, but then it becomes excessive. It’s almost like a concert movie with the slightest of plots intermittingly mixed in for good measure. The story itself is too obvious and takes too long to play out and then when it finally gets going and we have some actual dramatic tension it then resolves too quickly. Cannon is pretty good and even does her own singing. Irving on the other hand seems in-over-her-head and looks quite uncomfortable playing on stage. She got nominated for a Razzy award for worst supporting actress and I felt it was well deserved. Rodeo clown-turned-actor Pickens is super in one of his best roles that allows him to show both his comedic and dramatic side. Lane Smith is hilarious in a brief, but funny stint as an aggressive agent looking to get his client, a guitarist who wears some very loud suits, into the band while also trying to push some cheesy money making schemes on the side. The part where Pickens attacks Nelson with a gun and chases him all around a lonely beach is amusing as is their drunken bus ride along an isolated Mexican highway. I also liked Irving meeting with her father after the secret of her affair has come out as well as her moment of apology to Cannon, but this all comes during the film’s final 20 minutes. Before then it’s just a lot of stock footage of Nelson on stage, which is nice if you enjoy his singing, but not if you’re looking for an actual movie, which at times this barely seems to be. This entry was posted in 80's Movies, Comedy/Drama, Movies that take place in Texas, Musical, Remakes, Road Movies, Romance and tagged Amy Irving, Dyan Cannon, Entertainment, Lane Smith, Movies, Review, Slim Pickens, Willie Nelson. Bookmark the permalink.